FSB Shopping Alert: The Limited is Coming To Manhattan For a Limited (ha!) Time! | Fashion. Style. Beauty. | Life is short. Live well. FSB Shopping Alert: The Limited is Coming To Manhattan For a Limited (ha!) Time! Anyone else miss The Limited here in NYC? This Gen X favorite and current day beloved store for all things fashionable hasn’t had a presence in Manhattan for ten years, which has caused the shopping equivalent of a Quest for Fire for me as I hunt down store locations when I travel. 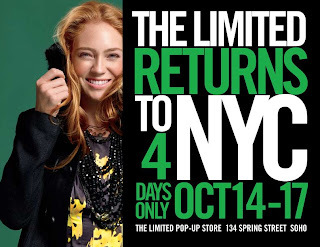 The shopping treks can cease, Manhattan shoppers, because The Limited is coming to our beloved Soho for four fabulous days next week! Recreated as a pop-up store (i.e. temporary retail boutique), The Limited will have live window installations and daily in-store experiences that will not only draw on current offerings, but the rich history of the store as well. Oh yes, ladies, the pop-up store will hail the return of the iconic 80’s wardrobe staple, the Forenza collection. Write this down: be one of the first 84 customers each day to purchase a Forenza Collection piece at the original price from the Collection launch in 1984. Send this along to your BSBs (Best Shopping Buddies) and mark your calendars for next week. The Limited is coming to Manhattan!